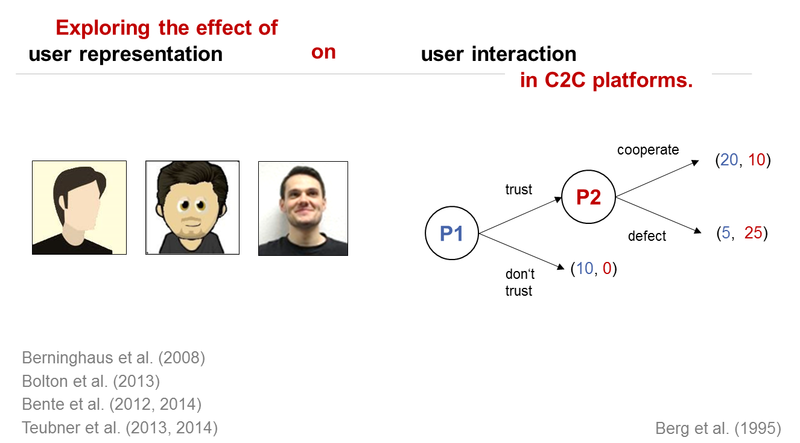 With this research project we aim to systematically explore how different forms of user representations in consumer-to-consumer (C2C) platforms affect the users’ behavior and its antecedents, e.g., social presence, hedonic value, and trust. These novel platforms face the challenge to generate and maintain trust among their users (e.g., by using real names and photos), which easily comes into conflict with Internet users’ concerns for privacy and online anonymity. We build upon and extend a well-established economic standard experiment – the trust game – as a model for consumer-to-consumer interactions in the sharing economy.